Blue Gemini was a United States Air Force project first proposed in August 1962 for a series of seven flights of Gemini spacecraft to enable the Air Force to gain manned spaceflight experience prior to the launch of the Manned Orbital Development System, or MODS. The plan was to utilize off-the-shelf Gemini spacecraft. Blue Gemini would consist of two NASA missions that would include a USAF co-pilot and would accomplish NASA objectives. These would be followed by two more NASA missions that would have USAF crews. Those missions would be devoted to NASA goals, but would include USAF experiments if possible. The final phase of Blue Gemini would consist of three dedicated USAF missions. One of these would be an Agena Target Vehicle rendezvous mission and it was possible that some of these later missions might carry only a single crew member. The other seat would be occupied by experimental equipment. Possible payloads included a Manned Maneuvering Unit that would allow an astronaut to maneuver around the spacecraft, an advanced navigation system, an erectable structure, and a large ground mapping radar. The plan was to end Blue Gemini missions approximately four months before the debut of the MODS space station. Blue Gemini was canceled in January 1963 by Secretary of Defense Robert McNamara after he decided that military experiments could be carried aboard some NASA missions, ie. Project Gemini. McNamara also canceled MODS at the same time. In December 1963 McNamara likewise approved the development of a Manned Orbital Laboratory (MOL) which was essentially a revived MODS. 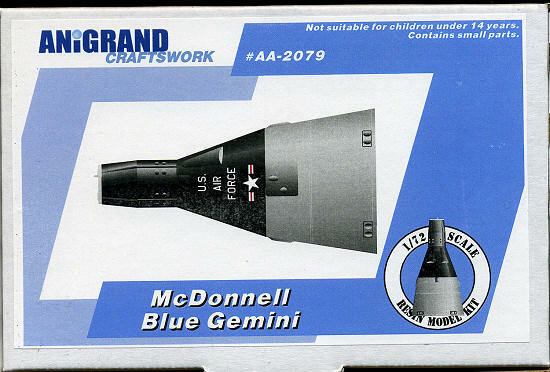 Blue Gemini should not be confused with the Gemini B spacecraft that was developed for MOL. Gemini B included a tunnel through its heat shield to enable the astronauts to reach the MOL spacecraft. Because Blue Gemini was only a paper project that was canceled before NASA started any Gemini flights, no Blue Gemini hardware was constructed. A test article at the National Museum of the United States Air Force, at Wright-Patterson AFB, Ohiois the Gemini B spacecraft, not Blue Gemini. It is recognized by its distinctive "US Air Force" written on the side, and the circular hatch cut through the heat shield. Molded in Anigrand's usual tan resin, the quality of the detail work on the kit is really quite good. Anigrand have molded the seams for the capsule exterior along a rib line, making clean-up a bit easier than the norm. There was a small amount of mold slip on my sample that will require some additional work to repair. The kit provides an interior that includes a pair of bang seats and an instrument panel. There is no detail on the panel so the modeler will need to cobble something together for this and the side walls. The Gemini capsule was festooned with knobs, switches and dials on just about every clear space. 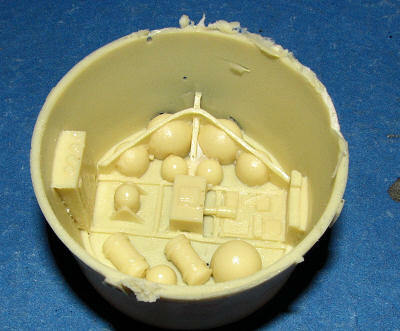 Typical of Anigrand and other resin kits, there are the inevitable air bubbles, air cavities and resin 'balls' in some corners that will need to be cleaned up. My equipment section has one portion of the exterior rim that was either short shot or snapped off when the resin pour stub was removed. This will have to be repaired, probably using plastic card or epoxy filler if modeled in the 'in flight' mode. The model can be built one of several ways. One is in full landing position with gear extended. In this form, there is no nose cone and no retro section or equipment section. One can also mold it as it was atop the Titan missile with these latter sections installed. 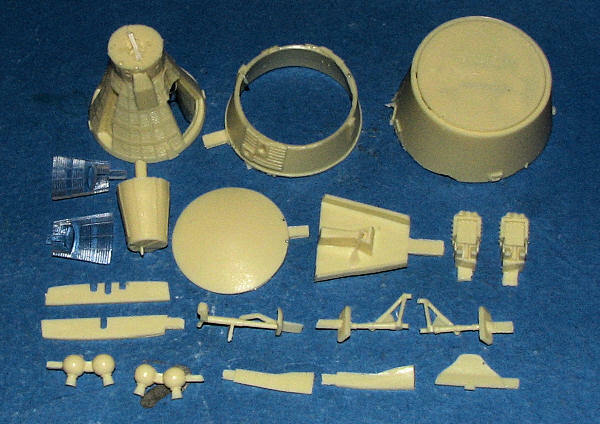 The equipment section has a huge amount of detail molded into it and it may well be that the modeler would prefer modeling the kit 'in flight'. Of course, there is also a re-entry option with the equipment module gone and the retro package shown. No matter how you do it, you will not use all of the parts. The two hatches are molded in clear resin so that the windows will be easy to keep clear. Instructions are in a photo-realistic mode showing the major sub assemblies as well as how it will look when complete. Markings for one vehicle are provided, this also providing basic, generic painting information. It will be interesting to see how the small decal sheet conforms to all the corrugations as Anigrand decals are not known for succumbing to setting solutions. In closing, I should mention that this kit comes in a very sturdy box that is not end-opening, a trend that I do hope continues. Once more, Anigrand has provided an interesting kit and of a subject that is increasing the number of space related subjects being produced. I wish them well in this endeavor and encourage you to pick up one of this so that the trend can continue. Thanks to www.NostalgicPlastic.com for the review kit. You can get yours today with free shipping in the US and Canada.